Welcome to Heavenly Care Services, where we strive to provide the best in ethical,.compassionate, competent care, with the welfare and happiness of our clients as our number one priority. 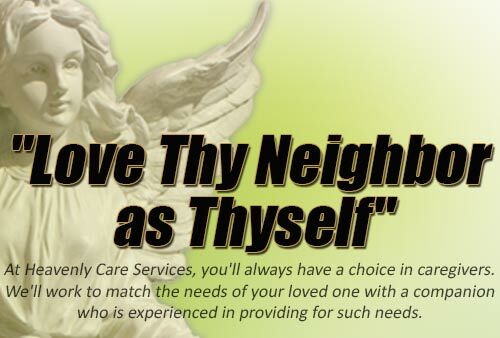 At Heavenly Care Services we know it isn't easy inviting others into your home to provide care. So with that in mind, we give you the opportunity to interview and select the caregiver we refer to you. When you meet our caregivers, you'll see that at Heavenly Care Services intergrity always comes first. At Heavenly Care Services, you'll always have a choice in caregivers. We'll work to match the needs of your loved one with a companion who is experienced in providing for such needs. Some of our services include Light Housekeeping, Assistance bathing, Reading, Medical Services and Much More!